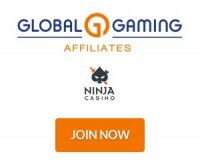 Global Gaming Affiliates is the affiliate program for Ninja Casino and Spellandet Casino brands. Affiliates who wish to promote an up-and-coming online casino brand targeted at Scandinavian markets should definitely check out the Global Gaming Affiliates program. Once they’ve managed to officially partner with the program, affiliates will get to promote the Ninja Casino and, in the future, the Spellandet Casino brands. Featuring generous bonuses, promotions, and quality casino games, these brands are guaranteed to give players a lot of value for their time and money. Thanks to these features, these brands have relatively high retention and conversion rates which can consequently result in better earnings for affiliates. Speaking of earnings, the program has generous revenue share commissions awaiting affiliates who manage to successfully promote its brands. Depending on the number of first time depositors they’re able to refer, affiliates will get to enjoy 25% to as much as 40% of the revenue generated by the online casino from their (the affiliates’) referrals’ transactions. Other than this, the program also has a CPA commission structure that it can offer to affiliates on a case by case basis. Affiliates who may be unable to promote the program’s brands due to illness or other emergencies/events can also get up to €10000 in commissions per month up to 3 months. As of this writing, Global Gaming Affiliates supports Bank Transfer, Skrill, and Neteller for payouts. The program calculates the commissions due to its affiliates at the beginning of each month for referral activity/transactions made in the previous month. Should the affiliates’ commissions (from the previous month) reach the €100 minimum threshold, the program will then process the payout so that they’ll get their earnings by fourteenth of the month. In the event the commissions fall below the minimum requirement for payout, the program will defer processing to the next month or until such time affiliates manage to get earnings of at least €100. To ensure affiliates have an easy time promoting its brands, Global Gaming Affiliates will provide them with the necessary marketing and promotional materials. Once their registrations are approved, affiliates can then log in to their accounts and access banners, links, and other rich-media content that they can then integrate to their affiliate sites and/or campaigns. The program also has a comprehensive reporting solution that affiliates can use to check on their campaigns’ running referrals, commissions, conversions, clickthrough rate, and other important metrics. Affiliates can access these in real time or have the program generate a comprehensive report that they can then use to get an idea of what their campaign/s need to improve. Board is the regulatory body that issued (and regulates) the license that the online casino uses to operate.